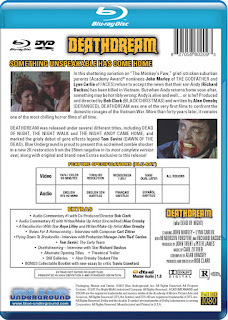 I was super happy when I learned DeathDream was coming to Special Edition Blu-ray. DeathDream is one of the most underrated Horror films out there. It is a pure morbid and deeply dark film. What better to experience this film than on a new beautiful transfer and High Definition quality by one of the coolest movie DVD/Blu-ray companies out there. Blue Underground is a true treat to the cinema world. I have collected and been a fan for a very long time. They always treat the film and the fan to a true high-quality treat of perfection, and the new outlet of DeathDream is a prime example of how this company shines. DeathDream has never looked any better. Blue Underground has given and shined this underrated film. Jam packed with extras. A video and audio mastery. This Blu-ray is a must own, must experience reality. This is directed by one of my favorite directors. The man behind the classic, one of a kind Christmas movie, comical masterpiece of Cult Status, A Christmas Story (You’ll shoot your eye out.) Bob Clark has always been an underrated director. To me he should be mentioned in film studies and film history. It’s a true shame he was killed by a Drunk driver. He also directed another memorable and cult status horror film the one and only Black Christmas, (not the crappy remake, but the cult original from 1974). Bob Clark was a genius, he had his hits and his misses, but he left a vast world of amazing cinema. Who can forget the iconic comedy film’s Porky’s and Porky’s 2? I just love talking about Bob Clark. He had such a different aspect on the cinema world. He created so many different styles of cinema and that is what truly stands out. DeathDream is one of his finest examples of cinema. Starring a wonderful cast of actors and actresses. The movie shines and what makes this dark, twisted horror stand out is the performance by Richard Backus. Your main character of Andy. Backus gives a twisted disturbing and yet thoughtful examination of mental illness, but, the Undead. This is a funny concept and yet not. Andy goes to war and is scarred beyond all belief. Well his parents get word that Andy has been killed in action in Vietnam. Yet Andy ends up showing up. That is what also makes this film stand out. There is an ultimate statement in the plot of this film. There is a statement about war and the effects and aftermath of war. What Andy becomes shines ultimately in the idea War is hell. You can’t simply call this a Zombie film, because there is statement behind the script. There is an ultimate understanding about Andy’s problems, which is all caused from his stint in war. Backus only acted in under 20 performances in his career. His last work was on an episode of Law & Order. It’s a true shame because I think Backus is a wonderful actor. Many will know him from his TV experience. He was on the TV show Ryan’s Hope in the 80’s. He would be nominated for a Daytime Emmy for the role of Barry Ryan in Ryan’s Hope. It will always be Deathdream that truly created a lasting impression of Richard Backus in my mind. Besides Backus there are three shinning roles. Three stand out performances that truly leave the viewer satisfied in film quality. First, I must speak about the one and only John Marley who plays Charles Brooks in the film. Marley is a true cinematic thespian of film. He shined in a flawless career. Both great and small performances. Whatever he acted in, one knew his face. One knew his performance, and one remembered him always. Performed in over 160 performances. He was a late bloomer to cinema. He started performing in 1947 but was not really noticed or not given his acting stride until the late 60’s early 70’s. Mainly before that it was all small roles or television, or uncredited parts. Many will remember him as Jack Woltzt in 1972’s Masterpiece The Godfather. I truly believe that he was a very underrated actor. Marley should have acted and performed in top notch films, masterpieces or thought provoking unforgettable pieces cinema. I think he was one of those that never got the limelight or household name realities that he deserved. To showcase his brilliance in performance, he was nominated for an Oscar for Best Supporting Actor for the 1970’s film Love Story. Also starring the wonderful Lynn Carlin as Andy’s mom Christine Brooks. Many will remember her from the movie Faces as character Maria Frost in 1968. She stopped acting in 1987. She was another one of those underrated performers. She truly stood out in what ever she performed in. She mainly starred in TV series and TV movies, from The Waltons to Trapper John MD, to Murder She Wrote and many others. Her brilliance can be showcased in the before mentioned film, Faces, which was her first acting role. This role of Maria Frost in 1968 awarded her an Oscar nomination for Best Supporting Actress. And lastly, I must bring up Henderson Forsythe who plays Doc Allman in the film. Forsythe will be known by many for his long running performance as Dr. David Stewart on the soap opera As the World Turns, which he played that role for 32 years. Mainly a television TV actor with both TV series and TV movies, he did act in several films including one of my all time favorite films, 1983’s Silkwood. He to was a very underrated actor. Death Dream was called so many different titles over the years. It had the titles: Dead of Night, The Night Walk, and was called The Night Andy Came Home. What makes Deathdream stand out above and beyond is not just the unique direction, odd story, and ultimate brilliance that is Bob Clark, but it had a one of kind special effects and makeup legend behind all it’s gory moments. This was the amazing debut of the one and only makeup and effects master Tom Savini, who to the horror world needs no introduction. The man behind the mastery of the original Dawn of the Dead. I shouldn’t have to say anymore. On an interesting note about Deathdream, is that the concept and inspiration for the film came from the classic short story by W.W. Jacobs titled The Monkey Paw. The classic story is a priceless short story that if you have not read, you need to. It’s a great piece. Also, this film was a low budget Independent film that has lasted and remained. Fans know this film, respect this film, talk and showcase its brilliance in film circles. Blue Underground has brought this classic horror film to a whole new generation on a perfected Blu-ray of mastery that they only seem to be able to do. This film is brought out in the best complete version available. This 2K restoration from the original 35mm negative is something to praise. I have seen Deathdream in so many ways. From VHS, to DVD, to bootleg versions. Now I experience it the way it should be experienced. Blue Underground created what looks like a whole new film. The audio has never sounded any better. It’s crisp and spot on in dialogue and music. Dynamic audio. Equally dynamic video. The imagery is flawless and is cleaned with a tight visual perfection. English DTS-HD Mono English Subtitles, French Subtitles and Spanish Subtitles. 1080p HD Resolution. Wide screen 1.85:1 50GB Dual Layer All Regions. This is jam packed with exclusive extra’s that shine. You get two Audio Commentaries. The first one is an older commentary by Bob Clark himself. Which is an awesome listen and worth the price of the Blu-ray itself. The second commentary you get is with the writer himself Alan Ormsby. Another priceless commentary. It’s always a wonderful reality to hear from people involved with the film. You get so much more out the feature by listening to those who created it. You get a video A Recollection with Star Anya Liffey and with Alan Ormsby. You get a program titled Notes for a Homecoming which is an interview with composer Carl Zittrer. Which is another thing that must be mentioned about in the film. The music is spot on and just adds to the brilliance of the dark, morbid film. You get a program titled Flying Down to Brooksville. Which is an interview with production manager John Bud Cardos. You get a special feature titled Tom Savini: The Early Years. Program titled Deathdreaming, which an interview with star Richard Backus. You get the special feature showcasing the many alternative opening titles that the film was called. You get the Trailer, Still Galleries and short student film by writer Alan Ormsby. Also, you get a wonderful Collectible booklet with a brand-new essay by film critic Travis Crawford. This small 20 page booklet is a wonderful exploration on the film. Also there is 15 pictures in the booklet. You also get a reversible Blu-ray Insert. Deathdream is ultimately a very creepy and haunting film. There are moments of simplicity, filmed in a way that just comes across as artistic and thought-provoking at the same time. It’s equal parts horror and equal part drama. Blue Underground has done a fantastic job. A flawless Blu-ray. A wonderful array of Special Features. A dynamic transfer. Crisp audio and amazing video imagery cleaned and transferred with perfection. 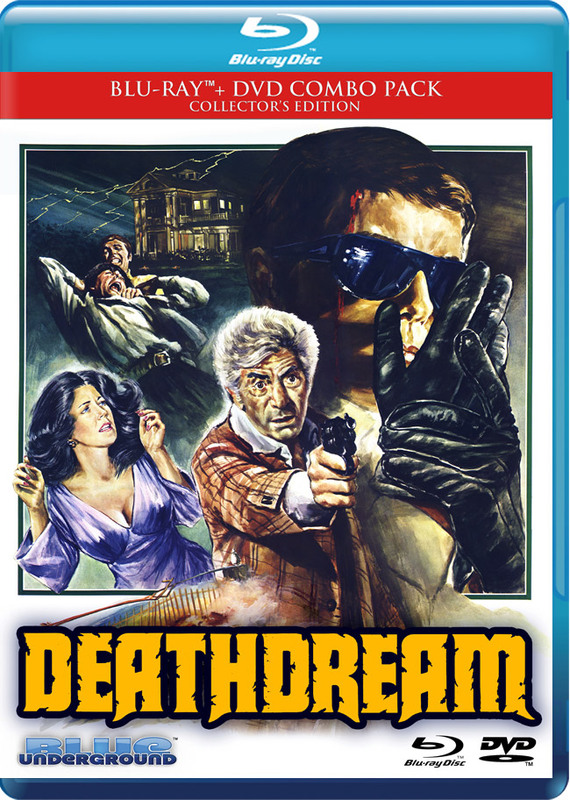 Deathdream is a film that shines. A film that needs to be seen. A film that makes a statement. It’s a film that works in so many ways. An underrated gem. A brilliant Cult film. Deathdream is truly a film that will always make it’s point, and its point is that it’s a film that should always be brought up in film circles. Make sure you head over to http://www.blue-underground.com/ to buy all the wonderful DVD’s and Blu-rays. The main page that gives you these beautiful releases on top quality Special Editions.